Born in Portsmouth, Ohio, and raised on Columbus’ South side. Mary McClendon grew up in the church where she sang in the choir. Mary has often said “she can’t recall a time when she didn’t want to sing.” She fondly recalls her first solo – “Ave Maria,” during an Easter service. She was in the third grade. One could easily hear the special gift in her voice, her singing came naturally. Mary‘s mother had a beautiful soprano voice, and she often encouraged Mary to listen to a variety of music. However, her mother clearly wished for her to become a gospel singer; often mentioning gospel artists such as Mahalia Jackson and Shirley Caesar. But Mary desired to sing all music.She remembers the first time seeing Porgy and Bess on an old black and white television. It was then she knew this would be her life’s journey. Porgy and Bess remains one of her favorite operas. Shortly after graduating from High School, Mary began working for Motorists Mutual Insurance Company.She soon learned they had a company choir, she immediately joined and began traveling all around Central Ohio. And as the saying goes….there are no mistakes in life, only discoveries. It was then that Mary discovered she was replacing the great Ms Nancy Wilson, who previously held the same job position prior to relocating to New York. Music and Art have always been a part of Mary’s everyday life. Due to Mary’s nature, it seems befitting that she would carry a degree from the Columbus College of Art and Design (CCAD). During her senior year at CCAD, she was asked to hire a band. That band, a trio, consisted of Jimmy Carter (B-3 Organ), Frank Hooks (trombone) and Andy Smith (drums). Mary was coaxed up on stage to sing a Roberta Flack tune. Later that year, the trio and Mary began a three year run performing at Clyde’s at Courthouse Square in downtown Columbus. This became the place where many national / international musicians would stop by for a jam session, while visiting Columbus. Soon, Mary was singing with the greatest performers known in the jazz world. Mary has enjoyed working with many local musicians…Bobby Floyd, Don Tate Jr., Bobby Pierce, Geoff Tyus, Hank Marr, Mark Flugge,Tom Carroll, Jeanette Williams, and Michelle Horsefield to name a few. Things went so well with Tom Carroll that the group and Mary performed together at Lindey’s (German Village) for thirteen years. It was during this time she began an association with the Columbus Jazz Orchestra (JAG) and continues to be one of their featured vocalists. Mary has enjoyed a variety of venues, having worked with the Columbus Symphony and Balled Met. She has held many leading and supportive roles with Gallery Players, Center Stage Theater, Nia Performing Arts and CATCO. 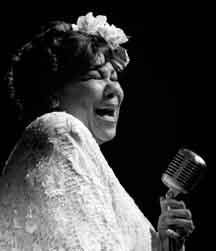 Mary’s most recent endeavor was with CATCO and the acclaimed one-woman show, Lady Day at Emerson’s Bar and Grill. This show focuses on the last year in the life of Billie Holiday. Lady Day ran for seven weeks to sold-out audiences. Due to Mary’s warm, exuberant personality, her talents have led to an additional career in voice-over talent. She is a featured voice on many commercials and television spots…Franklin County Children’s Services adoption and child abuse campaigns, Election Campaigns, Industrial Videos, and she is the voice of L’Lala in the Land of Adventure at the Center of Science and Industry (COSI). Mary has dedicated her life to serving others by way of participating as a volunteer for Children’s Hospital (Twig 110) and was the chair-person of the famed Ebony Fashion Fair, their annual fundraiser. She also worked in the Columbus Public Schools and loves the PBJ and Jazz series where she works with many local musicians. She enjoys working with children of all ages and offers vocal coaching to individuals and/or classes. Singing is Mary’s passion, and she is gifted to sing almost every kind of music, but if asked to pick, she would choose jazz and jazz ballads, which are her favorites.